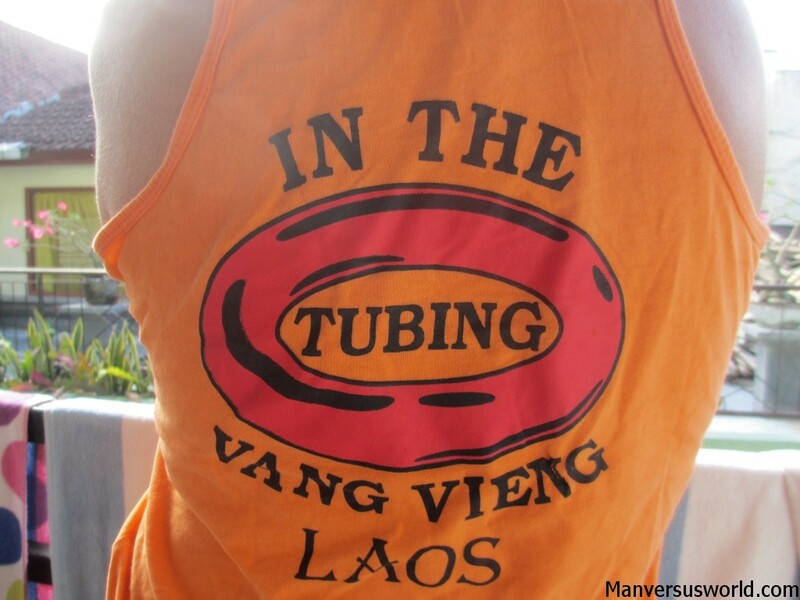 More fun than a barrel of monkeys and infinitely more dangerous, tubing is to Vang Vieng in Laos what the running of the bulls is to Pampalona in Spain – albeit with more alcohol and less tradition. That is to say that it is nearly as fun as it is dangerous; a veritable rite of passage for backpackers all over the world and the bane of worrying mothers everywhere. 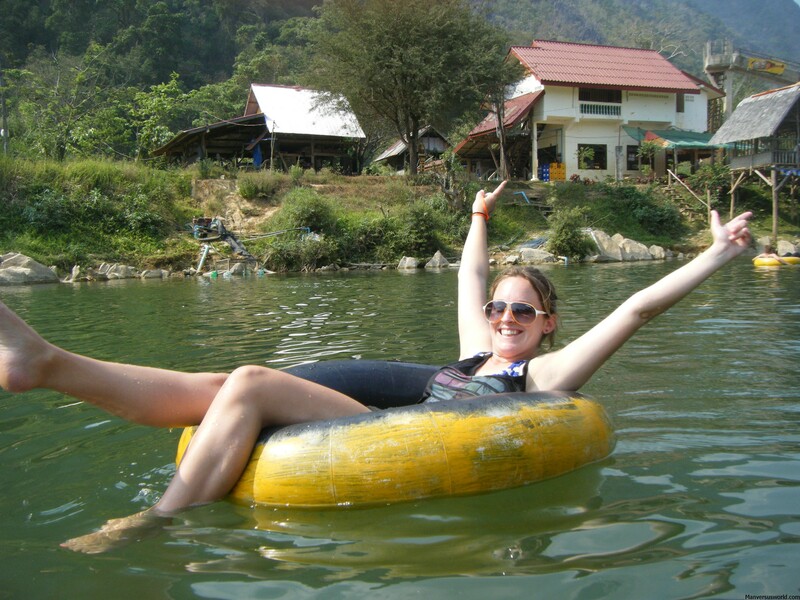 Like the running of the bulls, the dangers of tubing in Vang Vieng are well documented. More than a few unfortunate and inebriated travellers have lost their lives tubing, drowning or plummeting from ramshackle towers and zip-lines. Many more, however, have had the times of their lives – myself included. Relaxed and carefree, roughly four hours north of Laos’ capital city of Vientiane, Vang Vieng seems an unlikely setting for arguably Southeast Asia’s premier party town. 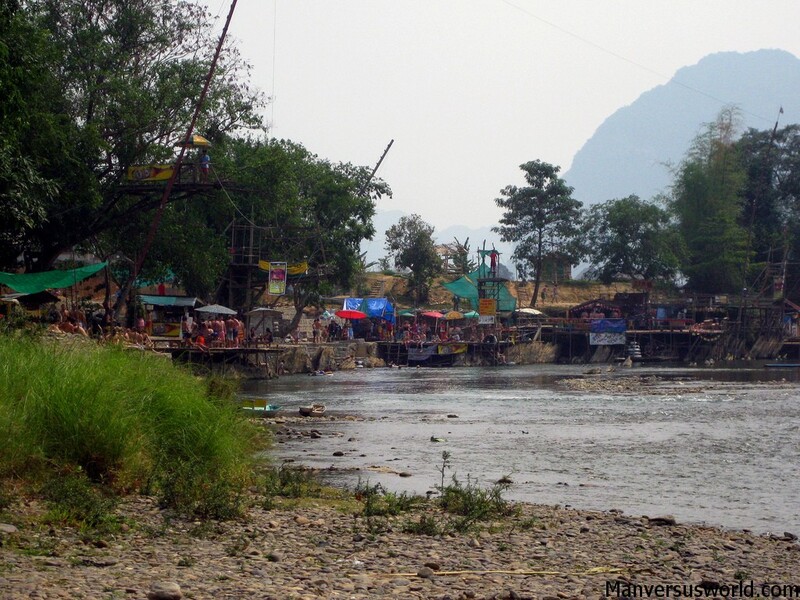 Hot-air balloons float high above, the beautiful karst hills their breathtaking backdrop, while children play in the usually slow-moving and shallow Nam Song River below as locals go about their lives, bartering and chatting with tourists. The bars are packed with travellers, drinking and eating, chatting and laughing, all watching Friends, Family Guy or South Park as they recline on cushions. It seems as though nothing else is ever on in Vang Vieng but nobody seems to mind – especially those euphoric on magic mushrooms. 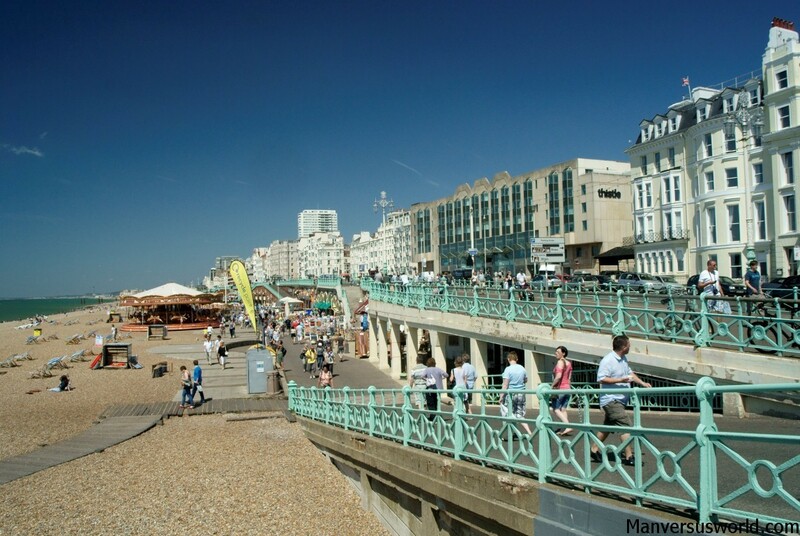 It’s all very relaxed and quiet – but a few miles away hundreds of tourists play. Seemingly as soon as they wake up, the young and young at heart are hiring big rubber tires and climbing into the back of trucks to be whisked several miles away from town, where the drinking and partying will begin. Drunk on cheap-and-cheerful buckets of whisky and cola, Mojitos and bottles of Beerlao, tubers dance and party all day long; when they’ve had enough of one bar they simply jump back in the river on their rubber tube and move on to the next. Enticed by signs promising free drinks and food, wet T-shirt contests and illicit substances, flying foxes and giant water slides, partygoers merely wave down youths with ropes when they want to be hauled in to the next bar. 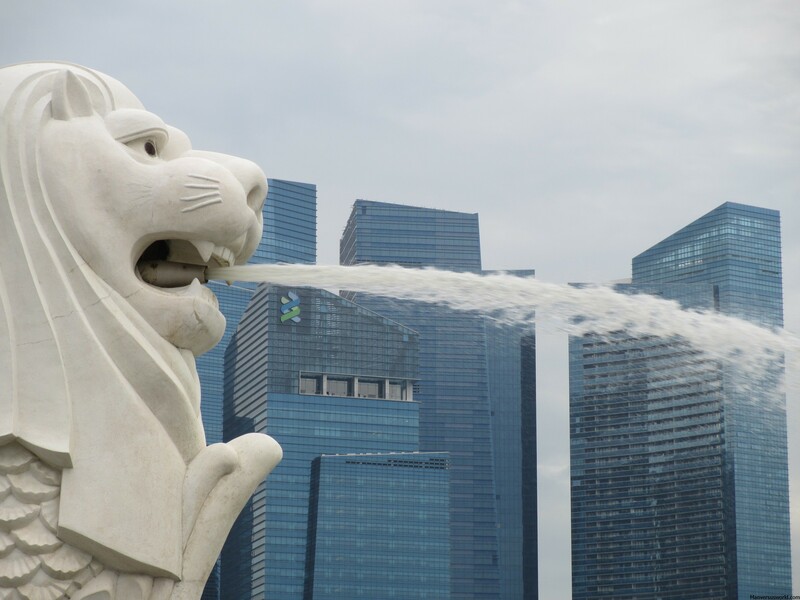 It’s quite an operation, perfected over more than ten years of being one of the foremost hedonistic pleasures in South East Asia. The circuit takes roughly three hours to complete – even quicker during monsoon season (May to October), with the only caveat being that you need to get your tire back by 6pm or you’ll lose your deposit. Bars cover only the first part of the river and the last hour or so can be a strenuous, extremely sobering experience if the river is low and you’re rushing to beat the 6pm deadline. To avoid the rush, hit the river no later than 11am. Naturally, the ghosts of those who have met an untimely end while tubing loom large in Vang Vieng, prompting many to call for the party to end – at least in its current guise. 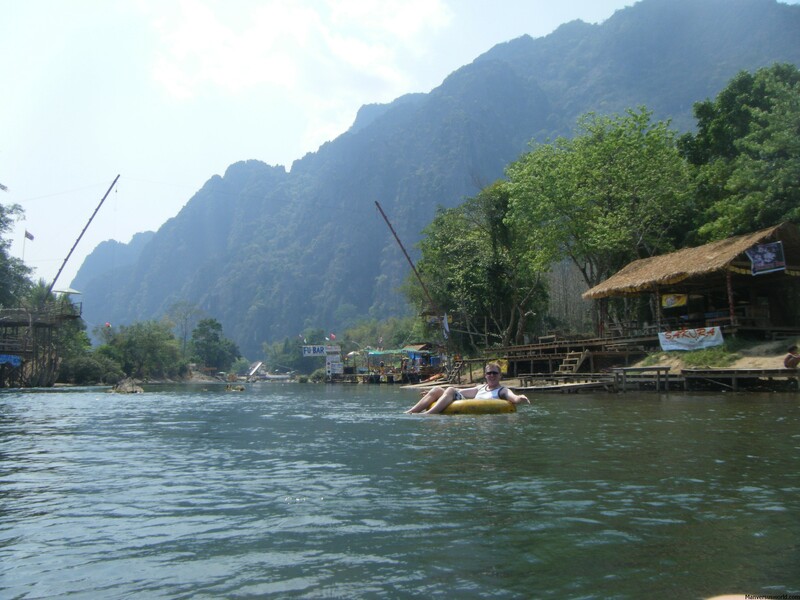 According to The Guardian, at least 27 travellers have died tubing in Vang Vieng and only recently a Melbourne woman came into trouble when she was poisoned by unregulated Laotian whisky. The combination of drugs and alcohol, zip lines and waterslides, the river and relaxed inhibitions undoubtedly proves a heady mix – but for most people, only their cameras are in any real danger. So relax, enjoy a bucket of alcohol and let the good times roll. Know your limits, watch out for your fellow tuber and travel in pairs or a group and you’ll live to drink another day – or at least long enough to purchase the ubiquitous “In the Tubing” singlet vest. I’m wondering, I’ve been reading that one should never leave valuables behind (in their rooms) when heading out for the day. Or even for that matter, never let them go out of sight. Passport, credit cards, ect. Makes sense. But I wonder how to take care of it when you’re swimming., ect. Cheers Mike – I appreciate the compliment! I’m not sure what the solution to this problem is, to be honest, but I can tell you that I always left most of my valuables in my room, either pad-locked in my backpack or hidden somewhere in the room like under the mattress or in with my pile of dirty laundry on the floor. My thinking was it was safer there (I nearly always stayed in private rooms) than on my person where I could be pick-pocketed or on the beach for obvious reasons. I realise a potential thief would likely find my valuables in my room but by hiding them I’d at least delay them a little bit. And I’d like to think that lugging my heavy backpack around would slow them down at least a little bit. Fortunately I didn’t have to test these theories! It was a real nightmare when I bought an engagement ring mid-trip!! That’s why I proposed to her earlier than I planned – I figured it was safer on her finger than me carrying it around! Meant to ask you, do you need to be a decent swimmer to go tubing? The mrs isnt so confident, especially after a few beers. Thanks mate. Esther is only 5ft 3′ ish, so thinking I might have to chuck some arm bands on her if its too deep or the current too fast. well, that one dictates for caution and extra care. 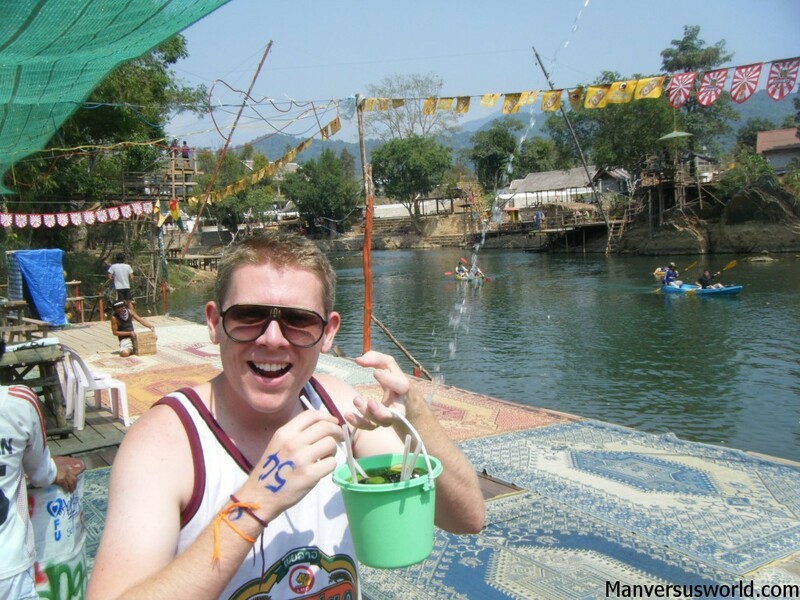 I would love to step into Vang Vieng when I heads up to Laos! Cheers Wends! Definitely stay safe if you decide to tube! You definitely should! It’s a lot of fun. 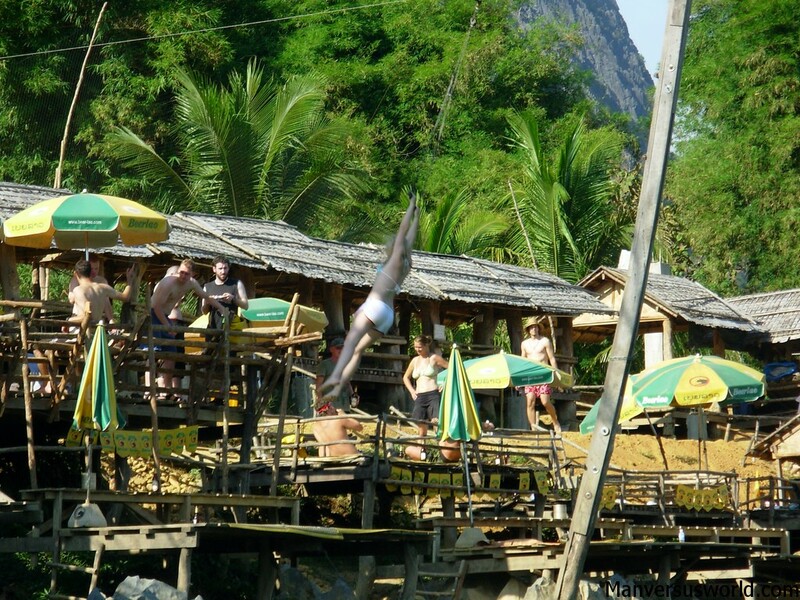 I can’t believe how little the tubing scene in Vang Vieng has changed. Just as much alcohol, athletic idiocy, and scrambling home at low tide. It was a lot of fun for me, even if I did bleed while tubing in Vang Vieng!